During the first year of experimentation with underwater television cameras, we have seen more eels than all other fish combined. Their behaviour is very interesting and this is just a preliminary header for the main article to follow. This photograph is a still frame taken during video tests of a new underwater camera- the camera is only about 70mm long but the eel in the background is much larger! Attempts to study eels are not new, and had been carried out at the LNI from about 1970 onwards by Roy Mackal and others. Rip Hepple was involved in the catching programme at Achnahannet. The studies are discussed in "The Monsters of Loch Ness" by Roy P.Mackal. (see books page). 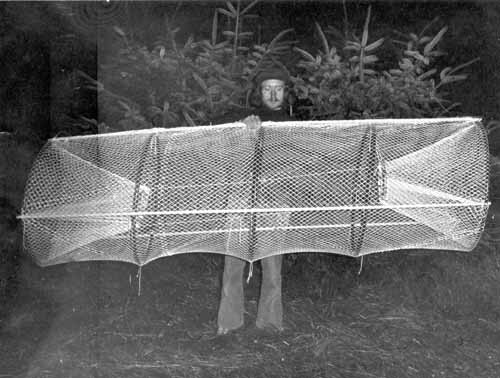 Here is a picture of an eel trap made by Holly Arnold and myself in 1973. It was built in response to the observations of very large eel-like creatures by Peter Hodge and Robert Badger. As far as I can recall, no eels were caught with it. It was made from "Alkathene" water pipe bent into rings and joined with short lengths of wooden dowel. The rings were held apart by 8 foot lengths of dowel rod, and the net material was supplied gratis by a travelling net merchant from St Monance, Fife, who had generously donated it to our cause. The net design is still the very height of fashion, even if the trousers are not!